Unfortunately the data reveal winners and losers. 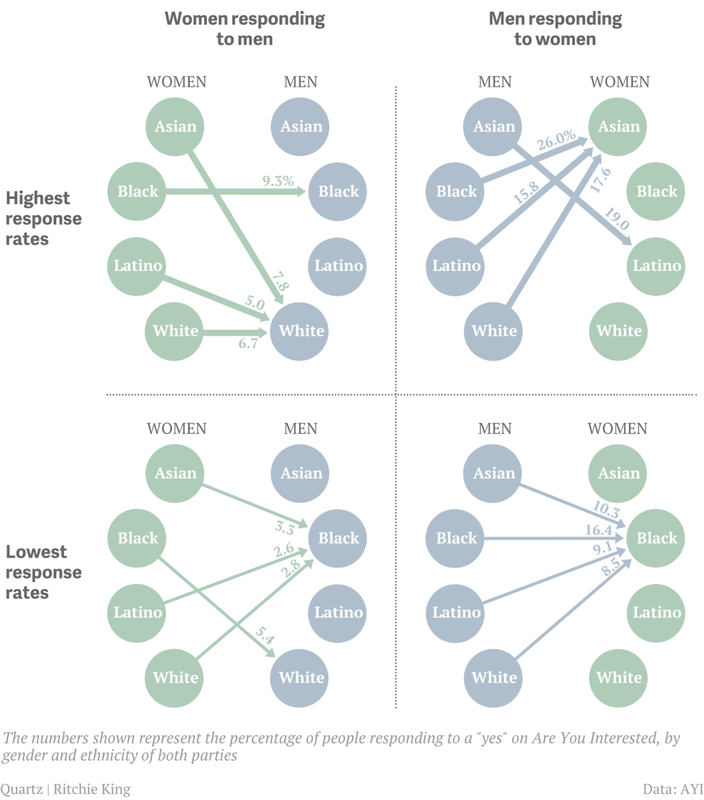 All men except Asians preferred Asian women, while all except black women preferred white men. And both black men and black women got the lowest response rates for their respective genders. As a sociologist, I am entirely unsurprised that race matters, especially in such a personal process like dating/mating. However, these findings may come as a surprise to the (quite significant) segments of the population who identify as color-blind; those who label contemporary society post-racial. And this is why dating sites are so cool. Social psychologists know that what people say and what they do have little empirical connection. Dating sites capture what we do, and play it back for us. They expose who we are, who we want, and of course, who we don’t want. As shown by Quartz, “we” fetishize Asian women while devaluing blacks. With a schism between what people say and what they do; between what they say and what the unconsciously think, surveys of racial attitudes are always already quite limited. People can say whatever they want—that race doesn’t matter, that they don’t see color—but when it comes to selecting a partner, and the selection criteria are formalized through profiles and response decisions, we, as individuals and a society, can no longer hide from ourselves. The numbers blare back at us, forcing us to prosume uncomfortable cultural and identity meanings both personally and collectively. Of course, what these sites tell us about ourselves does not stop at race. They also tell us that we care about things like income, physical (dis)ability and body size, exposing the range of isms that American prefer not to speak of in polite company, and certainly refrain from applying to themselves. At an individual level, how someone fills in hir preferences and the way s/he engages (or refuses to engage) interested parties, tells that individual a lot about who s/he is. But dating sites, at a cultural level, are incredibly revealing even before the first user signs up. Indeed, before anyone has answered anything, the architecture of online dating sites say a lot. Namely, they tell us what we value. They tell us which characteristics are the ones about which we are likely to care; about which we should care. More concretely, the moment a site prompts users to select racial identification and/or racial preference, an embedded race-based value system is both exposed and reinforced. As such, although the Quartz graph of user data is revealing, the presence of racial identification and racial preference on dating sites in general already demolish arguments about colorblindness and post-racial culture. Yes. Very interesting. A lot of interesting questions arise from looking at peoples behaviour on dating-sites. This analysis is simplified by the fact that people typically have already entered things like age, gender and sexual preference. A related interesting fact that OkCupid dug out of their database, is that men do not actually hold women to unreasonable standards for beauty, (atleast their users don't) - they investigated and found that if you ask men to rate the beauty of women, the response follows a classical bell-curve with the average centered. In contrast, if you ask women to rate how attractive men are, they are very harsh, rating a full 80% of all men as being below average, and being more than 5 times as likely to give someone a bottom score compared to a top score. Despite the fact that interracial marriages and birth of multiracial babies are increasing, racism is still a factor when it comes to looking for love online. I think that majority of people like to be in a relationship with their own ethnicity, not necessarily because of being racists, but because they feel more comfortable being with people they share the same traditions and cultures with. Some have the same religion so it makes it easier for them to get along pretty well. People with similar culture bear certain common understanding and tolerance, and those that speak same languages find it easier to interact. So it may not be race, but rather, culture and languages that may count. There are some exceptions though, but very few. Such people prefer dating others from different ethnicity because it's a way of learning another culture, traditions and religion. But most studies show that people prefer to date from their own ethnicity which I think gives them comfort and understanding. This doesn't actually logically establish any fetishization of Asian women, nor does it establish a devaluation of blacks. This is because correlation doesn't equal causation. The specifics of the data aren't integral to my argument. I'm arguing first, that race is a key organizing principle of interpersonal interaction and second, that online dating sites offer data which illustrates this. The particular patterns aren't the crux of the argument. Herman, Melissa and Mary E. Campbell. 2012. “I Wouldn’t But You Can: Attitudes Toward Interracial Relationships.” Social Science Research 41(2):343-58. Sweeney, K., Borden, A., (2009). 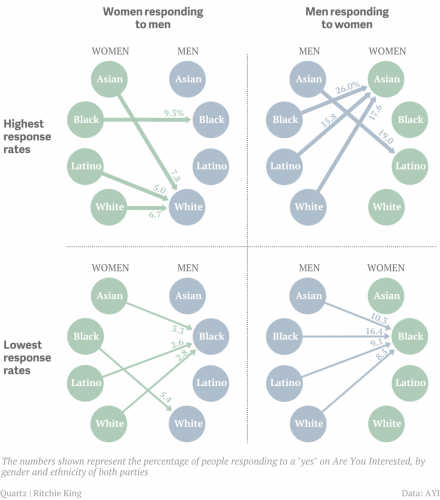 Crossing the Line Online: Racial Preference of Internet Daters. Chito-Childs 2005 article "Angry Black Women"
You said you were arguing that race is a key organizing principle of interpersonal interaction. Why are you arguing the veracity of an idea that shouldn't be news to anyone? If it's to convince disbelieving readers to believe what you think they should already know, then you ought to logically establish your idea to convince your readers. Why are you arguing for something that you say takes pages to prove, in an article that's only a few hundred words? What exactly are you against here confuzzled? It seems like you have a bigger bone to pick when it comes to race and dating than simply the fact that the author does not do what you want her too? Most blogs are do not engage in the things you are asking so why is this particular blog and subject matter so important to you? It seems like if the blog perked your interest, then the best thing would be for you to then go and research it more. Why you haven't and instead are demanding the author of the post do more for you seems odd. So what is really the problem here? Lets talk about that because you don't seem so much as confused as you do defensive. I'd like to see the demographics of people willing to use online dating services, period. I'd also like to see a study of how much these findings coincide with media exposure and promotion of what races (and body types) the media owners consider to be "beautiful." Given that no control group exists that is exempt from societal influences, and that no one is able to recognize every influence that may be influencing a particular behavior, anyone is certainly able to argue that no amount of correlation 'proves' causation. However, given that causation isn't possible to demonstrate on data such as these, confuzzled's argument is pedantic at best. At worse, the hypothetical example suggests that black women categorically behave in ways that are unattractive to men. There's a term for implications that skin tone somehow dictates different behavior: racism. It's not that the research you've shown me isn't valuable. I'm not at all trying to say that people's stories aren't important, noteworthy or educational. All of this stuff adds to our body of sociological knowledge. It just doesn't lead to the conclusions that the authors seem to be trying to draw, because all these authors seem to be trying to draw grand conclusions about what demographics do, or what the world is like, in the United States. These grand conclusions may or may not actually exist. If they do, I have no idea how to come to them logically, if that's what you're asking. Confuzzled, you're certainly living up to your name with your assertions that this is a 'science blog'. I'm pretty certain cyborgology has never declared itself such. More specifically, in no way do I perceive Jenny as trying to draw 'grand conclusions' about society. She specifically states that she's interested in the data released because they offer a rather telling rebuttal to the assertion of some that race doesn't impact people's decision. Perhaps you're approaching this article looking for proof that racism exists. That you will not find here. That racism is real and has a measurable impact on behavior is readily understood by all of the authors here. I'm not a sociologist but found this article and the follow-up comments interesting. For me it seems that a lot of people like to overanalyse love and attraction. For me, finding my soulmate the traditional way was difficult so I bit the bullet and joined an online website where I found my wife and best friend. We're from different countries, cultures and races but none of that was, or is now, important to us. This may not be the way for a lot of people to meet but I'm glad I tried on-line dating. It would have been interesting to see, within the piece, some data that could be used to understand the % of people that didn't stipulate ethnic preference - and also, if those not stipulating a preference, had identified their own ethic set. Facts are facts, whether people "like" the results of the findings or whatever "meaning" they've assigned to those figures has been interesting. I've visited here from Huffington Post - where many seem to be instantly scream "racist", which for me, says more about them, than it does the data. For those that do have an ethnic preference for potential partners - these are the results. We don't know if those that have an ethnic preference are inherrently racist, but it is highly likely that a some are. I personally, don't find the morbidly obese attractive - doesn't mean I hate them. It's just a preferance that I have, regarding what I'd define as attractive. Jenny, I think your blog was very informative and for me reinforced assumptions that are used every day to make so may other decisions. It concerns me that in 2013 we cannot admit that the gorilla is in the room. This argument would not have the significance that it has if not for the fact that these conclusions affect the selection of heads of state, CEO's, judges and juries. The nation and world is fast moving to a place that life as we know it may end. Race, ethics, lack of values and education are central to understanding how to navigate through this. I can see in the statistics that more men from around globe are messaging Asian women as compared to other nationalities. When it comes to black men and women, there are low responses from other races. That simple shows how people are racist towards other races. Although I respect others on what their preference are when it comes to dating online.